Minister for Transport Mr. Noel Dempsey has announced that the cabinet approved a new Road Traffic Bill today at its pre-Christmas meeting that will provide for the mandatory alcohol testing of all drivers involved in a fatal crash or a crash in which someone is injured. The new legislation is due to be published in early January 2011. The Road Traffic Act 2010, which was passed by the Oireachtas with all-party support on 7th July 2010, includes mandatory alcohol testing of all drivers involved in a crash resulting in injury and was due to come into force then but is now delayed until September 2011 when lower drink drive limits come into force. Minister Dempsey has decided not to wait until then to bring this life saving piece of legislation into force and ordered separate special legislation to be drafted and brought before the Dail next month. It will then be debated and passed by the Oireachtas and then enforced by gardai who attend the scene of a crash. Present legislation states that gardai “may” breathalyse a driver involved in a fatal or serious collision. This discretionary power has now been removed, unless medical advice is that the testing cannot be done. PARC members attend meeting in Garda Headquarters to discuss PARC's guide for families of victims following the death or serious injury of a loved one in a road traffic collision. Many hundreds of grieving relatives and friends of those who have died on our roads attended the ceremony. Many came to the special service from throughout the county and further afield to pay personal tributes to their lost loved ones. Mr. Noel Brett CEO of the Road Safety Authority opened the ceremony for PARC road safety group while members of the Gardai, emergency services and clergy took part. Monsignor Eamonn Martin (representing the Bishop of Derry), Fr. Seamus Gallagher (representing the Bishop of Raphoe), Rev. Sam Barton and Rev. Stanley Stewart lead the prayers during the inter- denominational service.The beautiful music was supplied by Hugh P. Doherty and his daughter Maria from Buncrana. Many families took the opportunity of signing a Book Of Remembrance as they entered and left a message to their precious lost loved ones. During the service the names of the 198 people who have died on our roads this year in Ireland was read out by a member of the Garda Síochána, including the eight people killed in Inishowen, in the country’s worst ever car crash on 11th July 2010. Rows of grieving families formed a line to read out the names of their lost loved ones and light their special candle in their memory. Absent families who contacted PARC and sent photographs of their lost loved one were also included in the service. PARC members lit a candle in memory of each of their lost loved one. The service was brought to a close by the playing of “Aidan’s Exam Tips” by Michael Leonard and his son Brendan from Leitrim, composed by Brendan in memory of his brother Aidan who was killed on New Year’s Day in 2005. After the service 32 balloons with the names of the 32 counties attached were released in memory of all those killed on the roads. New privately operated mobile speed cameras will come into operation at midnight tonight with 750 hours of monitoring in November and then gradually increasing to 6,000 hours per month from February 2011. Donegal has the biggest number of camera sites at 63. Cork (62), Meath (52), Wexford (44), Tipperary (40), Waterford (38), Louth (36), Cavan and Limerick both (35), Kilkenny (28), Kildare and Roscommon (27), Laois (26), Clare (25), Galway (24), Kerry and Westmeath (22), Carlow and Wicklow (20), Dublin, Longford and Offaly (19), Monaghan (17), Mayo (16), Leitrim (8) and Sligo (6). Speed cameras will operate 24 hours a day, seven days a week and locations may change over time. 15 GoSafe Gatso vans will be deployed on 16th November, rising to 45 by February 2011 which will be based at 600 locations. The cameras will only be at identified collision blackspots, and the private company operating the cameras are paid by the hour and not by how many drivers they catch speeding. Gardai will have overall control of the cameras and will decide where they will be positioned. Drivers caught speeding will be liable to penalty points and fines. An Garda Síochána uses eight mobile cameras in vans, 400 hand-held speeding devices and more than 100 automatic number plate recognition cameras which are installed in Garda cars for checks. Excessive and inappropriate speed are the greatest cause of death and injury on our roads. Speed at the point of impact really determines the outcome of nearly every single crash. The RSA road collision fact book for 2009 showed that Single-vehicle crashes last year speed was the main factor in 54 per cent of cases. PARC Committee Members attend meeting with Assistant Commissioner John Twomey and his team in Garda Headquarters today to discuss road safety concerns. The Road Safety Authority (RSA) announce details of the new Graduated Driver Licensing (GDL) System All new first time learner permit holders with effect from 6th December 2010 for motorcycles and 4th April 2011 for cars will be required to undertake mandatory initial basic training (IBT) with an approved driving instructor (ADI). The course will be 16 hours for motorcycle and 12 hours for car licences. The role of the supervising driver accompanying learner drivers will be strengthened and we will introduce a requirement for learner drivers to keep a learner log to be signed by their approved driving instructor and their accompanying driver. • The drink driving limits for drivers with learner permits and those in their first two years on a full driving licence will be reduced to 20mg/100ml. This legislation has been passed by the Oireachtas and will come into effect in September 2011. • The penalty points for specified offences will be increased for learner and novice drivers so that accumulation of penalty points during the learning phase and in the first two years on a full licence will pose a real threat of disqualification and will impact positively on risk taking and driver behaviour. • A standard Hazard Perception Test will be developed and carried out during the novice driver phase. The hazard perception test will specifically address risk taking and perception of risk among novice drivers. • The current driving test will be modernised to more effectively reflect driver competencies and to influence the learning undertaken by learners. We will introduce a new externally accredited driving test format in the last quarter of 2011. • Novice drivers will be required to display an R (restricted) plate during the first two years of their full driving licence to support the restrictions that are placed on their licence for that duration. The current Driver Theory Test question bank and supporting learning materials will be reconfigured to make it more effective as a learning tool.Engaging with the Department of Justice and Law Reform, the Gardai and the Courts Service to develop the range and combination of sentencing options available to the courts for driving offences for learner and novice drivers. Mr Noel Dempsey Minister for Transport in a phone call through his spokesperson has informed PARC that he is working on a solution to the delay in implementing compulsory testing of all drivers involved in injury related crashes and is determined to have an answer in three to four weeks. He has promised to keep us informed. President Mary McAleese signs the Road Traffic Act 2010 into law today, making it mandatory to test all drivers involved in collisions where there has been death or injury (or where injury is claimed to have been caused). Figures in June 2010 showed that more people had been killed in Donegal than in any other county so far this year, with 8 people losing their lives on our roads. By July 2010 that figure rose to 16. Donegal has the second highest number of serious road crashes, with 2,368 per million compared with 530 per million in the capital. Over an 18-month period between February 2004 and October 2005, 25 people lost their lives on the Inishowen Peninsula in Co. Donegal. PARC re-submit request to Garda Commissioner for the abolishment of crash form fees for bereaved families who have lost loved ones in road traffic collisions. The Road Traffic Bill 2009 was passed in the Dáil tonight. PARC Committee members attended. Breath testing becomes mandatory at the scenes of fatal & injury related crashes.The Road Traffic Bill also reduces the blood alcohol limit from its current level of 80mg/100ml to 20mg/100ml for learner, novice and professional drivers, and to 50mg/100ml for other drivers. Learners and professional drivers caught over the 20mg limit will receive a three month ban. Other drivers caught over the 50mg limit but under 80mg would receive three penalty points and a €200 fine, if they do not challenge the conviction in court. PARC members attend Joint Transport Committee debate on necessary amendments to the Road Traffic Bill 2009. One of the key issues is mandatory alcohol testing of drivers involved in collisions. PARC Committee members attend Committee Stage of Road Traffic Bill in Oireachtas. PARC Committee Members attend ERSC [European Road Safety Charter] signing ceremony in the European Union House of Dublin. PARC Committee Members meeting with Garda Commissioner Fachtna Murphy and his team in Garda Headquarters. Irish Medical Organisation AGM – Dr. Declan Bedford calls on the Government to enact the proposed legislation to reduce the legal drink driving limit without delay – to implement legislation for the mandatory testing for alcohol & other substances of all drivers in injury crashes without delay and for legislation to ensure that all persons guilty of drink driving go for mandatory rehabilitation and assessment. 25th March 2010 PARC Committee meets Transport Dept. Officials. Briefing session for Dail Transport Committee members with PARC in Dail Eireann this week. Noel Dempsey signs cross border deal on motoring fines. From today motorists from Northern Ireland who earn penalty tickets in the Republic will be chased across the border to pay their fines. The cross-border agreement will also apply to drivers from the Republic who break the law in Northern Ireland. PARC members Ms Ann Fogarty and Ms Susan Gray invited to speak at the RSA Road Safety Officers’ Seminar. 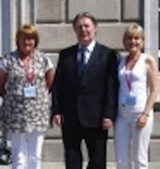 PARC members attend Dail for second stage debate – Road Traffic Bill. Open letter to press and Dublin City Councillors: We the undersigned SUPPORT the Dublin City Council initiative to reduce speed limits to 30km/h in the centre of the city, for the following reasons- The Campaign co-ordinated this letter, garnering support from many civic groups for the 30km/h limits. It was issued on Friday February 12th. The road safety advocacy group, PARC, has spoken out in anger and frustration at the delay in passing life-saving road safety legislation, and have urged the Minister for Transport to act quickly to prevent more lives being lost on the road. 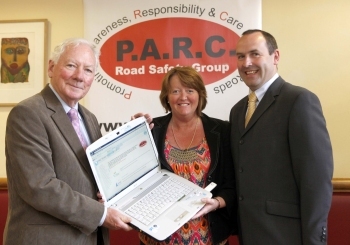 At their AGM in Dublin at the weekend, members of PARC called on the Minister to pass legislation as part of the new Road Traffic Bill to ensure that all drivers involved in a collision attended by the Gardai are automatically tested for alcohol and / or drugs at the scene of the collision, or later in hospital. Speaking at the PARC AGM, founder of PARC, Ms Susan Gray said that this piece of legislation would act as one of the greatest deterrents to drink and drug driving in Ireland as it would provide proper scientific analysis of the role alcohol and drugs play in road collisions. "We know from statistics that 9 out of 10 drivers involved in fatal collisions and who survive the crash are not tested for the presence of alcohol or drugs. Furthermore, we know that 4 out of 10 drivers who did not survive a crash were not tested for the presence of alcohol or drugs. Research tells us that alcohol is estimated to be a contributory factor in 1 out of 4 fatal crashes but because of the relatively low level of testing, we believe that this is a significant under-estimation. There are hundreds of families across Ireland who have lost their loved ones in a crash and who still, to this day, do not have answers telling them why this happened." She continued: "These families need to know if the driver involved in a collision where their husband, mother, brother or sister was killed had consumed alcohol or drugs. There is no reason why this piece of legislation cannot be passed immediately. Lives will be saved as a result so we are asking the Minister for Transport to make this a priority to introduce this life-saving measure, and give families the closure they deserve." Members of PARC also expressed their support of the proposed lower limit of 0.05 (50mg per 100ml of blood) and 0.02 for professional and novice drivers and urged the Minister to pass this legislation as soon as possible. "There should be no debate about lowering the drink driving limit. Drinking and driving is a choice and a choice that too many people recklessly make. Lowering the limit will save lives and prevent serious injuries and it is time for this legislation to be passed so that fewer lives are lost and fewer families have to suffer the grief of losing a loved one to a preventable tragedy", said Ms Gray. Other issues discussed at the AGM included concern at the wording of the new Road Traffic Bill and the use of 'forming an opinion'. PARC members called for this term to be removed from the Bill, with Ms Gray saying that "the low levels at which impairment can occur cannot be established merely by observation". From January 28th 2010 Irish drivers disqualified in the North and UK for certain road traffic offences will now have their disqualifications recognised and applied in this country - The same will apply to drivers from the North and UK who are disqualified here. Reckless or dangerous driving (whether or not resulting in death, injury or serious risk). Drink driving or drug driving. Refusal to submit to alcohol and drug tests. Other conduct constituting an offence for which a driving disqualification has been imposed by the State of the offense: of a duration of six months or more, of a duration of less than six months where that has been agreed bilaterally between the Member States concerned. This change has not come before time and will send out a very clear message to those motorists who have little concern for other road users - a message that is well overdue. Minister Dempsey is to be praised for bringing this change about - along with the RSA for including it in their Road Safety Strategy 2006-2012 - a change which will no doubt result in safer roads in Ireland for all of us. In April 2010 changes will be introduced to the NCT test - Under the new rules, a car will fail the test if it has tinted windscreens or front-side windows with a light transmission level of less than 65 per cent. Car exhausts generating over 99 decibels will also fail. Vehicles that do not have a visible 'E' mark on their tyres will also fail the test. The changes related to tinted windows were prompted by safety concerns, because studies have identified that night driving with tinted windows presents a disproportionate risk, compared with daytime driving. Drivers' ability to detect pedestrians and cyclists at night time, in conditions of poor visibility is of great concern. A total of 241 people lost their lives on the country's roads in 2009. 279 people lost their lives in 2008 … 38 less deaths in 2009. The Road Safety Authority's five year road safety strategy, which had originally targeted a reduction to 252 deaths a year by 2012, had been achieved three years ahead of schedule.